In 2005 has been built yacht Broadblue 385 named Vela. This boat is placed in marina Orhaniye in the surrounding area of Marmaris in Turkey. 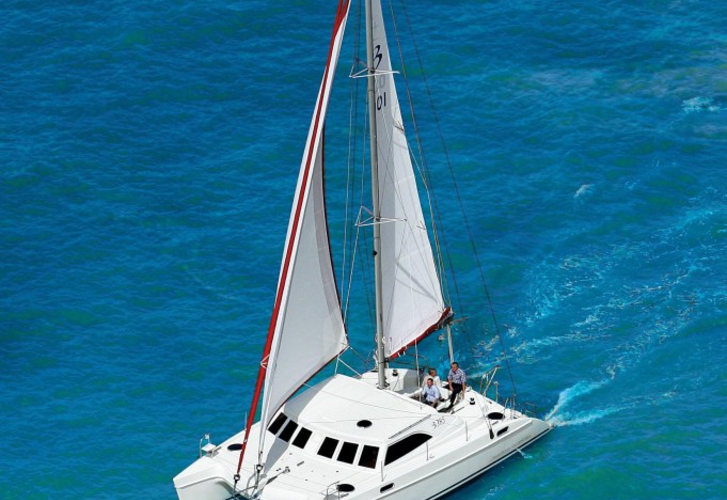 You can take in up to 8 persons on the sailboat Vela. Scheme of beds is 8 (6+2). There are 3 cabins located under she's deck. Vela has 1 WC. Use the search engine for search for other yachts by clicking on this link: Catamarans Marmaris. Tank for fuel is 320.00 l liters capacious , water tank has up to 650.00 l liters. In this vessel there is motor TMD 22-57,5 kW / 78 PS. With 11.58 meters of LOA and 4.46 m of width Vela offers enough space for comfortable sailing. Broadblue 385 Vela is equipped with: Dinghy, Bimini top, Anchor electric windlass, Outboard engine, Fishing tackle, Bed linen, Radio / cd player, Autopilot, Gps plotter, Gps, Radar, Furling mainsail. . Deposit is at the level of 0.00 EUR. Find about more search results by going to this section: Catamarans Orhaniye.